The following overview was provided by Dr. William W. Locke at Montana State University. Click here to see the original Understanding Katrina (PowerPoint 2.4MB Dec19 05) PowerPoint presentation. 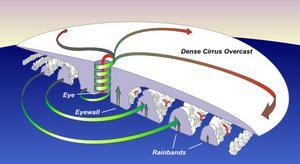 This overview describes Hurricane Katrina and the science behind the disaster. Topics include hurricane history in the Gulf Coast, the geologic setting of the area affected by Hurricane Katrina, the science of the storm, the storm surge and flooding in New Orleans and the damage incurred by Hurricane Katrina. Hurricanes are not uncommon occurrences along the Gulf and Atlantic coast. They typically strike promontories rather than bays or inlets. Since 1950, there have been two Category Five storms and seven Category Four storms. 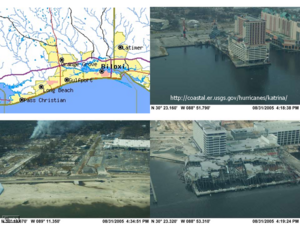 Hurricane Katrina made Gulf Coast landfall on August 29th, 2005, as a Category Four storm. Most of the coastal areas hit by recent (2004-2005) hurricanes have a historical expectation of a direct hit every seven to twenty years. They also have a historical expectation of Category Three hit every fifteen to fifty years, which happens to be within the lifetime of a noncommercial structure. Hurricanes hit South Florida most frequently, followed by South Texas and the Mississippi River Delta region. About 100 hurricanes, typhoons, and tropical storms occur globally each year, with ten (plus or minus five) in the Atlantic region. These cycles tend to be longer than El Nino/Southern Oscillation. There has been an increasing number of hurricanes since 1995. There are several possible interpretations of this increase in Atlantic hurricane activity, including natural climatic cycles and warmer ocean temperatures in the North Atlantic. 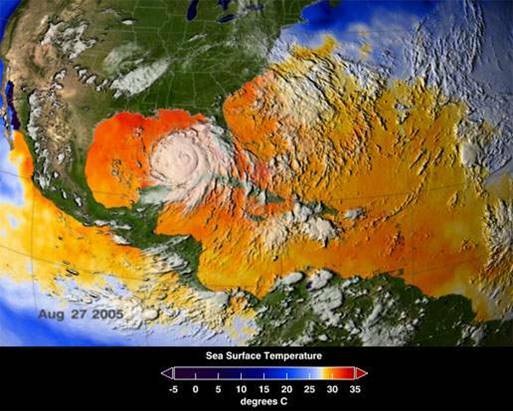 The eye of Hurricane Katrina made Louisiana landfall near Buras-Triumph on August 29, 2005, at 6:10 AM. By 10:00 AM Central Standard Time, several sections of the levee system in New Orleans had collapsed. The storm surge breached the levee system protecting New Orleans from Lake Ponchartrain and the Mississippi River. 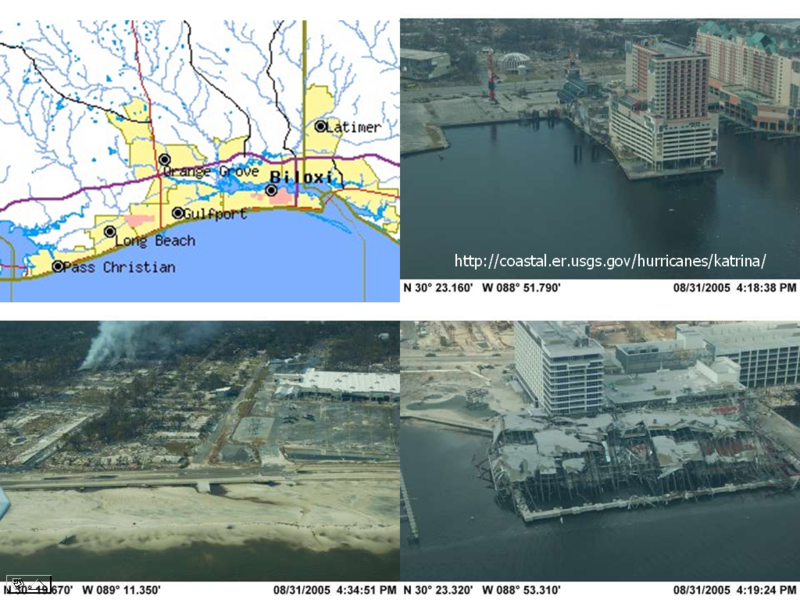 Hurricane Katrina also caused heavy damage along the coasts of Mississippi and Alabama. Much of the damage sustained in Louisiana was due not only to the storm, but also to the unique physiographic setting of New Orleans. Although the Mississippi River enters the Gulf at the South Pass, the river is only about two feet above sea level as it flows through New Orleans. The land surrounding the Mississippi River through New Orleans is at sea level, or lower, on all sides. Levees can be either natural or man-made. Man-made levees are constructed to prevent flooding on the land adjacent to the river. Natural levees are built by floodwaters depositing sediment along the river banks. They can extend more than two kilometers from the river channel. Natural levees do not protect rivers from large flooding events because they are built by frequent (five to twenty year) recurrent floods. Levees can, however, protect from most ocean-based flooding. During a severe flood these natural levees breach, which causees flooding and deposition of sediment in wetlands. This wetland flooding is often considered to be a natural means of absorbing floodwaters and thus floodwater does not continue to flow downstream. Where natural levees are heightened and maintained in order to provide flood protection, the floodwater cannot leave the river channel. Thus, the adjacent wetlands (also called a backswamp) do not receive periodic inputs of sediment and floodwater. Normally, rivers do not stand above the backswamp, but New Orleans is an exception. Due to the construction of levees along the river, the backswamp areas have subsided because they no longer receive sediment. This is why much of the area around New Orleans is below sea level. 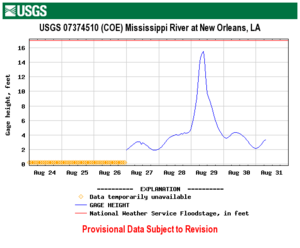 The Mississippi River has aggraded through New Orleans in order to maintain the slope necessary to transport its large sediment load (1 million tons per day) all the way to Southwest Pass. 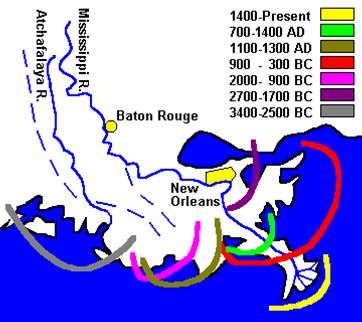 The Mississippi River Delta has been moving laterally over the last 6,000 years as the river migrates across the delta region. The river typically remains in one spot for less than 1,000 years. During that time sediments build a delta. Once the delta is significantly above sea level, the river channel will migrate to a shorter, more direct route to the ocean. Then the river builds a new delta and the cycle continues. However, the modern delta has remained in place for about 1,300 years. 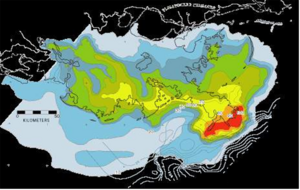 Based on radiocarbon dating of previous late Holocene deltas, the present distributary could/should have been abandoned in the last 300 years in favor of a more efficient route to sea level. 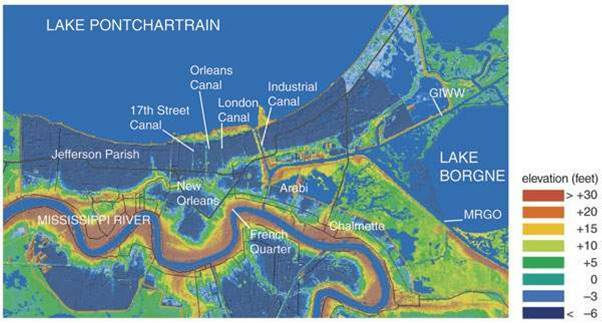 The present Mississippi River channel is twice as long and half as steep as shortcuts via the Atchafalaya River or Lake Pontchartrain. If the river were to seek these new courses, then the Mississippi would not flow through New Orleans. The course has been engineered to remain in its present channel and to continue to flow through New Orleans. Sediment thicknesses on the delta are greatest near the edge of the continental shelf. Thick young sediment accumulations (warm colors) compact and subside rapidly. Areas of older sediment subside more slowly. Levees are continually enlarged, both naturally and by humans, but they must be widened as well. Widening increases their weight, thus increaseing local subsidence. It is usually not feasible to design and construct a levee system to withstand any foreseeable flood (except in rare cases such as the flood wall system in St. Louis). 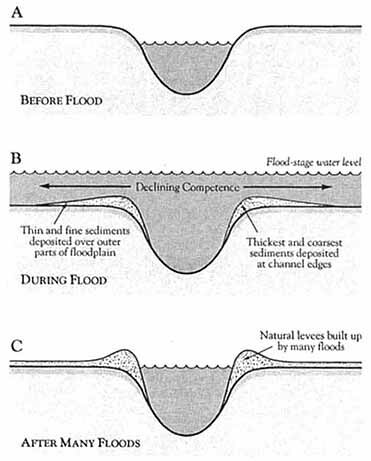 So, most levees are vunerable to overtopping as well as seepage through and under the levee. Hurricane Katrina was both huge and powerful. The well-formed eye is typical of Category Four storms. Warm sea water is the fuel for hurricanes. The evaporation of abundant water from the ocean allows condensation in the storm, releasing the latent heat stored since evaporation, thus fueling continued storm power. 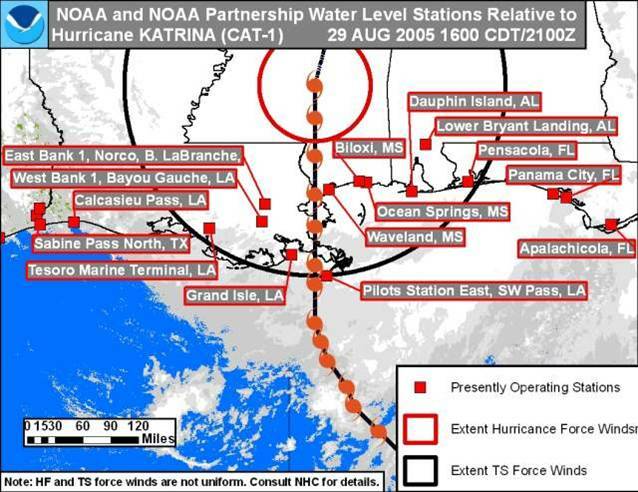 In the figure to the left, note the warm water under Hurricane Katrina. Shallow coastal waters commonly lack cold water that can diffuse storm power. In this figure, you can see that hurricane intensity closely matches the water temperature shown in the figure above. Hurricane Katrina reached Category Five over the warmest water. 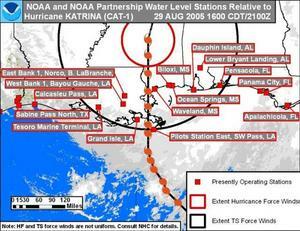 In addition, the track of Katrina was normal and generally followed predictions. The point of landfall was accurately estimated almost three days prior hitting the coast of Louisiana. 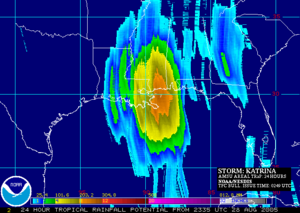 Before that time Hurricane Katrina been predicted to turn north sooner and impact the Florida Panhandle. 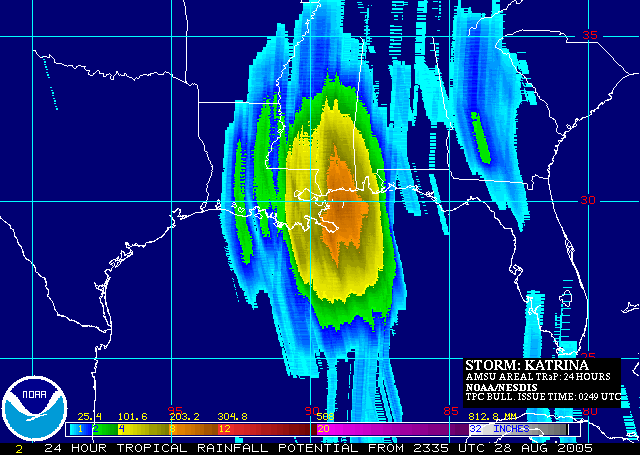 Predicted rainfall for Hurricane Katrina showed the maximum rainfall east of the storm-eye track. This accumulation as the storm passed provides evidence for the fact that the right front quadrant of a hurricane is commonly the most powerful. The powerful winds and rain occur here because rotational winds and steering winds (the prevailing winds which govern the smaller winds) are combined. On the right side of a storm there are storm winds plus forward motion which combine and create intense winds. On the left side of a storm winds are weakened because the steering winds push against the hurricane winds. New Orleans escaped the highest winds because the city was on the left side of the storm. Several key variables contribute to the size and destructiveness of a storm surge. 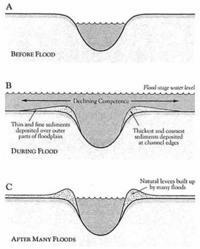 Factors such as onshore winds, central pressure, the state of tide, and configuration of the coast create surges and funnel wind and water into enclosed bays. A storm surge can exceed eight meters (twenty-five feet) in a worst case scenario. Katrina may have followed nearly the worst case path for a storm surge northeast of the delta; however, New Orleans was spared a direct hit from the storm surge. 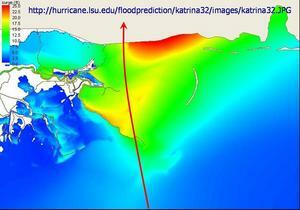 The figure to the left is the most accurate model available of the storm surge. It missed New Orleans and the maximum impact was along the Mississippi Coast. 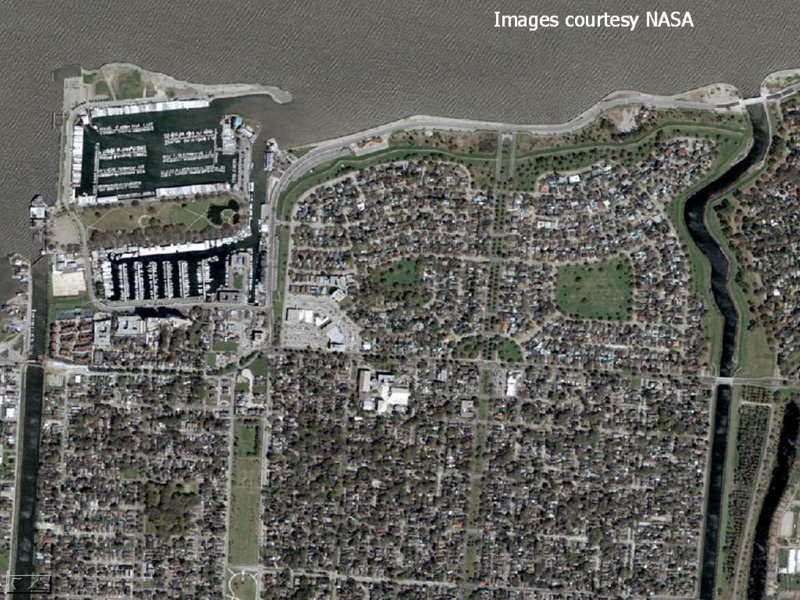 Note the submergence of the entire outer delta except the levees and jetty, especially along the west side of the Mississippi River. Note also how the Lake Pontchartrain Causeway intensified the surge at New Orleans. As Hurricane Katrina came ashore, most of the tide gauges were destroyed so no formal measurment of the storm surge was recorded. Scientists were able to estimate a storm surge of nine to ten meters (thirty to thirty-five feet). 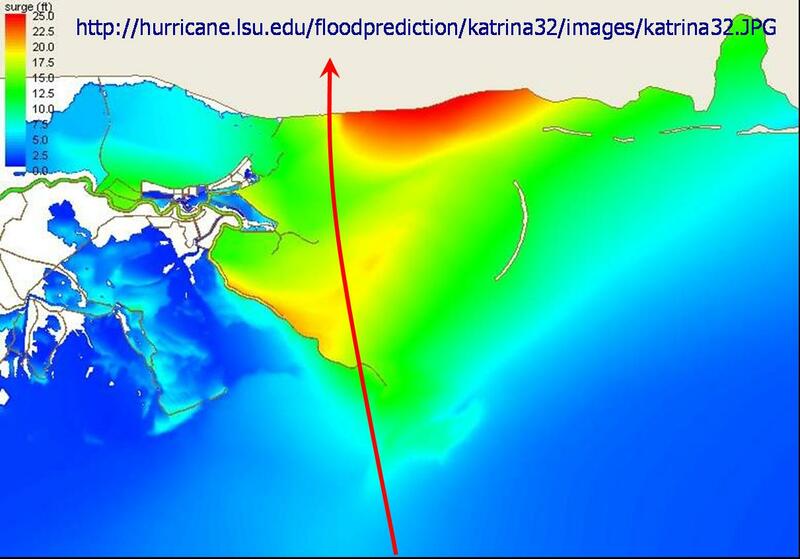 A 1.8 meter storm surge was recorded at the Southwest Pass hours before the maximum storm surge at New Orleans. This early recoding represents the nearest thing to an open ocean surge in the New Orleans area. 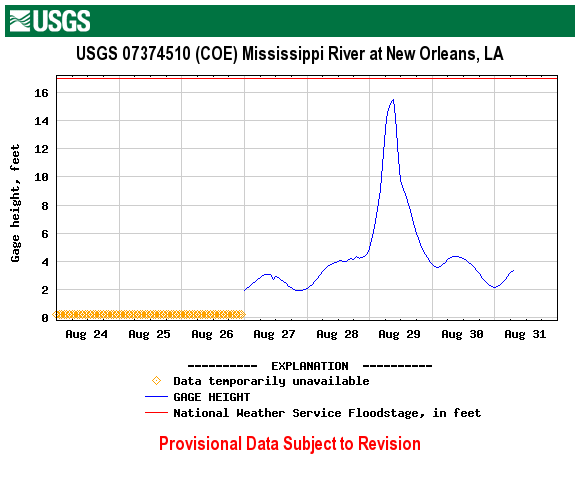 On the Mississippi River, a gauge recorded about a twelve foot storm surge up the river. The river height at New Orleans was higher than that experienced at any time upriver in Baton Rouge during the storm. Initial observer reports suggest that the system of levees and dikes (about 350 miles long) was only overtopped at one location along an industrial canal. However, later investigations showed it failed in several localities. The 17th street canal (on the left) apparently failed through buckling of a vertical "wing wall" atop the actual earthen levee. Lake Pontchartrain lies to the north. Flooded areas are dark on the satellite image taken after the storm. All satellite images courtesy of NASA. 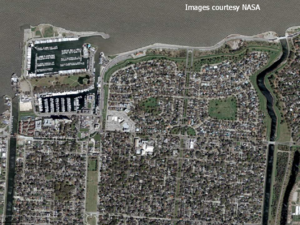 These before and after satellite images show flooding up to and slightly past the Superdome. Also shown is the extent of the unflooded natural levee along the river. The old parts of town, including the French Quarter, lie largely along the natural levee. Damage was extensive in the northeast quadrant of the storm. Some structures resisted the wind and waves (although lower floors were devastated), but poorly engineered major structures and all private housing was essentially eliminated. Hurricane Katrina was the third most intense, third deadliest and most costly hurricane United States history.